click on the image to view the exhibit in sequence. Jorge Luis Borges writes of a fountain on the idealist world of Tlön, a fountain which existed for several years only because of the seasonal migrations of birds. The image, at once seductive and elusive, attracts us to the power of the Idea over Reality. The power of the Idea would seem but a nostalgic nope in the reality we experience a reality which, to all appearances, ruthlessly dominates the Idea with the materiality of our forced participation. Yet it is Borges’s genius to strike at the moment of our seduction, to suggest that the systematically imagined world of Tlön, the idealist conspiracy of the Encyclopaedia, has so permeated contemporary reality as to create a global culture that responds only to the dictates of its senseless grammar: a culture predicated on dominating nature; a culture that eliminates the localization of historical complexity and obliterates the vernacular of lived experience. A labyrinth plotted by men, to be solved by men. glimpse an alternate and dimly remembered history. In much the same manner as her books mark the paradox of Idea and Object with the traces of other possibilities, Gülşen Çalik’s paintings arrest as at precisely the point which lies between being and identity. The paintings of the exhibition form a closely allied series of landscapes, providing visual relief for our logical exhaustion. Chief among them is Representation which presents a brief stylistic tour of Art History beginning with an unassuming sky above a mural-like landscape, framed in turn by a shabby villa wall and chessboard floor and flanked by a foolishly theatrical column. Before the painting, free- standing on the gallery floor, stands the painted columns double, oddly insubstantial in its mimicry. True to the principles of Tlön, the freestanding column of the gallery floor is clearly the objectified reflection of the hastily painted column of the villa, yet it is difficult to pinpoint what other claim to reality the painting may possess, and our eyes search for some clue in the landscape of the paintings background. Is it Nature or is it Mural-X? But if Representation proposes a certain sympathy with the ephemera of Idealism, its companion pieces, Landscape with Chair and Zeyneb, return us to the problem of Creation with gothic intensity, while Landscape with Stick delights in the exactness of the stick qua stick. 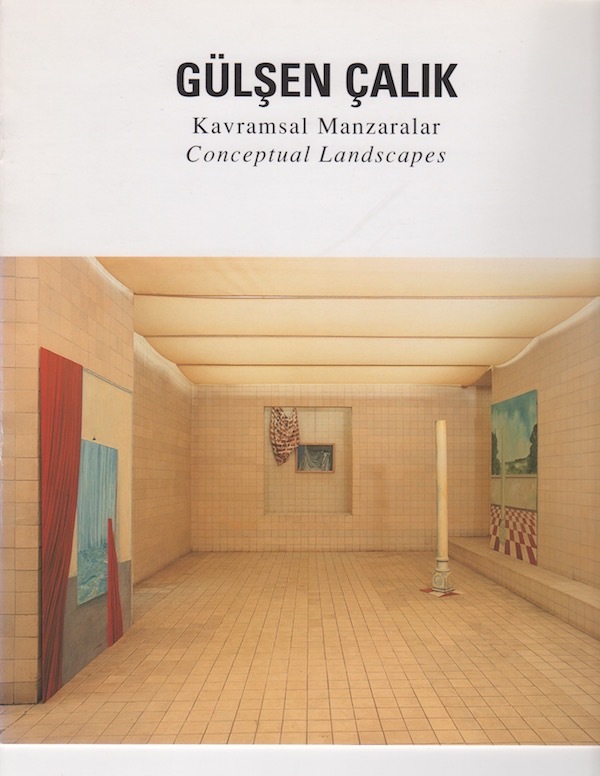 Gülşen Çalik is an artist who eschews the industrial fireworks of postmodernism in order to detain us amidst the reflective cognitions of modernity. Her landscapes are conceptual in the literal sense, doing for Art what Lewis Carrol did for Fantasy and Tolstoy for History. They recall Art as a form of thought. click on the image to view the exhibit in sequence. click on the navigation within the exhibit to move backward or forward within the work, or to return to this page. click on one of the arrows to return to the the beginning of the section or to the home page.